JBL’s 3 series monitors have always delivered great quality at a low cost, but the new MkIIs promise even more. We test the mid-range 306P. JBL monitors have been used in professional studios for decades, though it’s only in more recent times they have been accessible to the UK public at large. Back when Tannoy monitors reigned supreme on this side of the Atlantic, many top American studios were equipped with huge JBL monitoring systems, and they were ranked first in a US recording survey conducted by Billboard in the 70s. Always at the cutting edge of transducer design, JBL continues to innovate in monitor design, and now it’s time for a fresh look at its successful 3 series. The MkI versions of JBL’s 3 series monitors were highly regarded for offering excellent sound quality at affordable prices. Now upgraded to feature refined drivers and a new Boundary EQ adjustment setting, the MkII versions improve upon the original design. Many studio monitors these days boast one or more proprietary design features to distinguish them from the pack and these new JBLs are no exception. 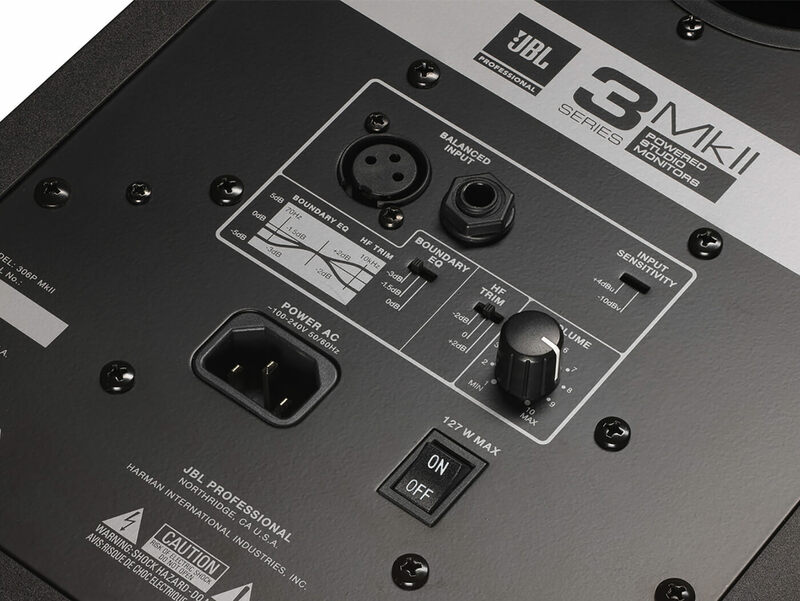 Originally developed for the company’s flagship M2 Master Reference monitor, the patented JBL Image Control Waveguide is designed to produce a panoramic soundstage with a broad sweet spot and solid ‘phantom centre’, along with superior integration of the mid/bass and high-frequency drive units. The other proprietary feature is JBL’s Slip Stream low-frequency port, which works in conjunction with the mid/bass woofer unit to deliver deep bass at all volume levels. There are three models in the series (plus a powered subwoofer), with the last digit of the model number indicating the size of the main driver. The 306P on test here occupies the middle of the range, incorporating a 6.5-inch mid/bass unit along with a 1-inch Neodymium tweeter. Like most modern monitors, the 306Ps are an active design with bespoke onboard power amplifiers. Each monitor is bi-amped, with both low- and high-frequency drivers powered by their own 56-watt Class D amplifier, producing a maximum continuous SPL of 98dB (110dB peak) and a frequency range of 39Hz-24kHz. The frequency response can be tailored to suit your room with switches situated on the rear panel. The HF Trim Control applies a shelving EQ at 4.4kHz (+/- 2dB), while the aforementioned Boundary Control is, in effect, a shelving bass cut of either 1.5dB or 3dB at 50Hz. This control is designed to be effective if the monitors have to be placed close to a wall or in a corner where bass boom can be a problem. with both consumer grade audio gear and higher-output professional equipment. On first inspection, the JBLs look a little plasticky; there is no real wood veneer or exotic cabinet material here. That may sound like a criticism, however for me, it’s a plus point. It means what you are paying for are the parts that matter, not fancy cabinetry. The boxes are made from basic MDF, which is a fine and cost-effective material, and the finish is matte-black PVC. Placed on heavy concrete stands in free space away from rear and side walls, first impressions were not only positive, but also raised a few eyebrows. The sheer scale of sound, both in terms of perceived frequency range and soundstaging, completely belie the 306P’s modest dimensions, so much so it would be easy to be fooled into thinking you were hearing our huge ATC SCM100A main monitors. This may have something to do with JBL’s Linear Spatial Reference design criteria. Rather than simply measure the monitor’s frequency response from the front, JBL made a series of 72 measurements, taken 360 degrees around each speaker. It’s also immediately clear that the Image Control Waveguide is playing an important part in the room-filling sound, as the stereo image remains coherent without being focused into a tight, central sweet spot. The Waveguide also does a superb job, ensuring fine integration between the mid/bass and high-frequency drivers, as moving my head vertically up and down a single monitor’s front baffle reveals no phase-related issues. Playing familiar material, the rich, expansive character of the monitors is quite seductive. Detail is there in spades, but it isn’t presented forcefully; rather, the subtle nuances of complex mixes are revealed from within a deep and solid soundstage. Some monitors of this size can sound ruthless, aggressive and forward in the treble region to accentuate detail, yet the 306Ps offer a more forgiving presentation without coming across as overly warm. Bass response is excellent, delivering deep yet smooth low frequencies without sounding overblown or slow. Upper bass and low mids are firm and punchy with no hint of tubbiness, integrating seamlessly with the broader treble region. In our fairly large control room, best results were achieved with the Boundary EQ Control set flat. I experimented with this control and could clearly hear how it would reduce excessive bass when used in less-than-ideal situations, if they have to be placed close to a rear wall, for example. High frequencies are delivered cleanly and openly, if not with quite the airiness of more upmarket designs. More importantly, the treble is in correct proportion with the lower end of the frequency spectrum, never sounding overexposed or detached from the midrange. This coherence and integration ensures the monitors give an even-handed account of mixes, while the absence of hyped treble makes mic selection and tailoring individual sounds easy. It wasn’t necessary to employ the HF Trim control, as our control room has been acoustically optimised and sounds great. 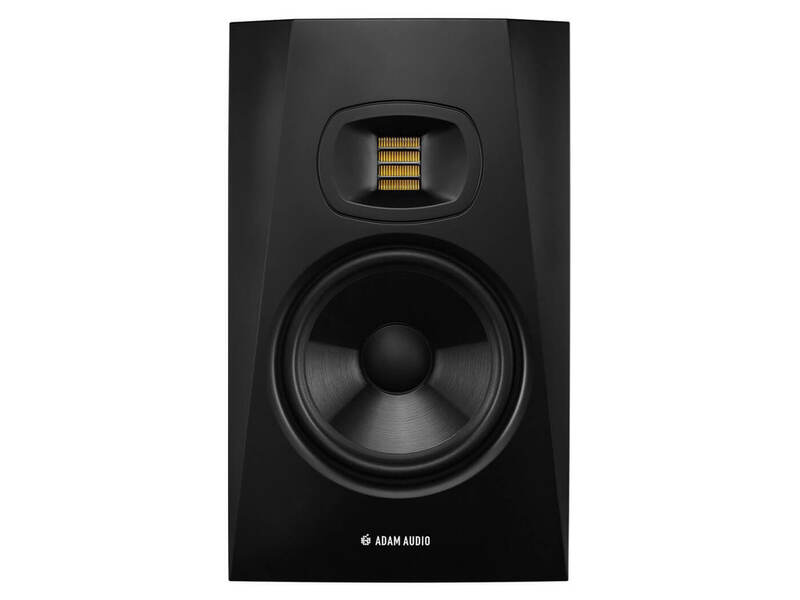 However, the 2dB boost or cut could come in handy if the monitors are used in a room that is either overly dead or lively. A major test of the 306P’s performance is to hear how well they integrate with our own monitoring system, comprising ATC SCM100A main and SCM25A midfield monitors, along with Yamaha NS10M nearfields. The JBLs perform superbly in this context, sounding naturally balanced, free from hype and insightful. In terms of scale, they sound far bigger than our NS10s and, with their widescreen soundstaging, on a par with the larger SCM 25As. With that in mind, I would easily recommend the 306Ps as the sole monitoring system in modestly sized project studios. Studio monitors are getting better all the time, and while there are many excellent designs with four-figure price tags, the sub-£500 market is currently thriving with some astonishing-sounding and good-value designs. 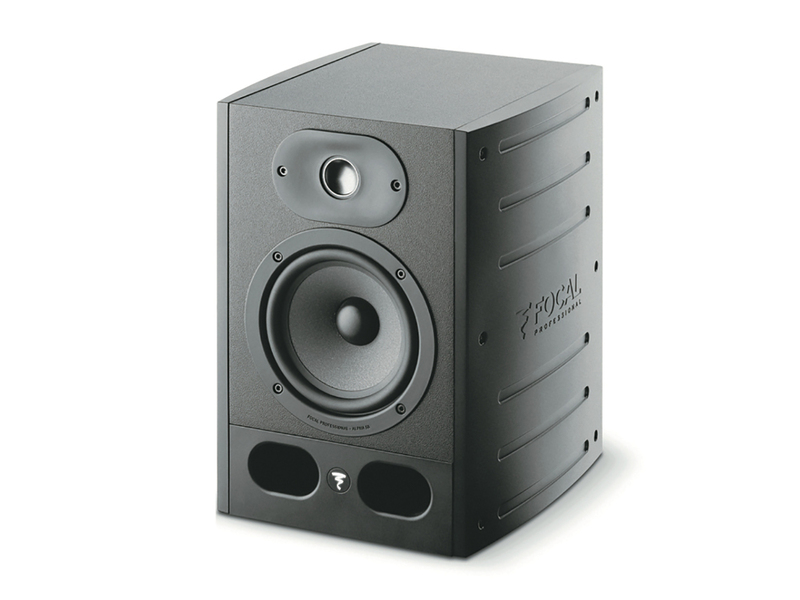 Anyone looking for monitors in this range should ensure the JBL 306P MkIIs are at the top of the audition list. 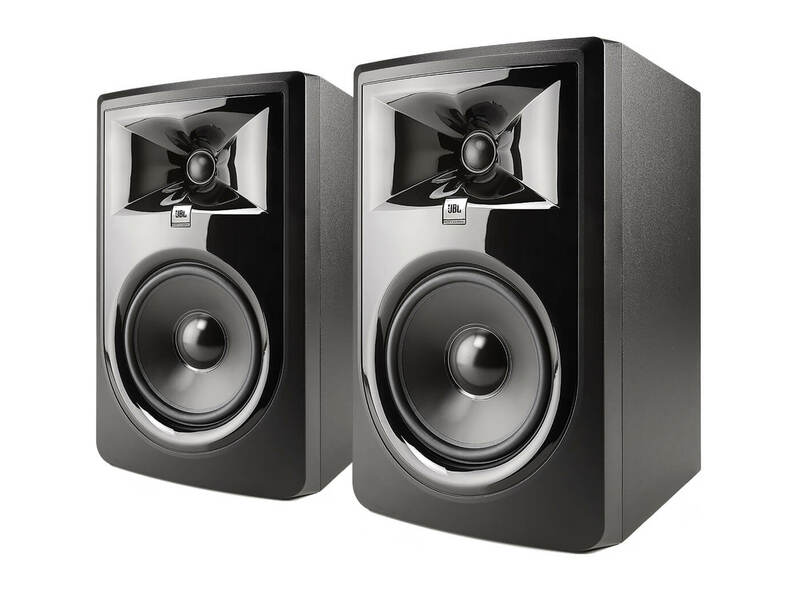 An excellent pair of monitors is the cornerstone of any recording studio setup and these days, many sub-£500 monitors aren’t the nasty- sounding boom boxes that used to plague the semi-pro market. The mantra always used to be ‘buy the best you can afford’, which really meant ‘expect to pay £1,000 or more for something decent’. Happily, advances in transducer technology and cabinet design, coupled with the synergy and convenience of onboard amplifiers, has improved the performance of more affordable monitors beyond all expectations. Manufacturers such as JBL, who can employ trickle down technology from flagship designs, are able to offer knockout monitors at knockdown prices. As great as they are, the JBL 306Ps face stiff competition so, as ever, try to audition several different models before shelling out. Astounding clarity, accuracy and audio quality for the price are assets that Focal’s Alpha series have in common with the JBL 306P. We were so impressed with them, we gifted them our Gear Of The Year award. These offer a big sound beyond their proportions, just like the JBL 306P. Bass response is on the generous side, and some potential users will prefer the leaner yet more coherent voicing of the smaller and less expensive T5V (£299). JBL’s MkII version of the popular 306Ps are big-sounding monitors with a smooth yet expansive character. Boundary EQ adjustability helps them integrate in a wide variety of listening rooms.